Since exiting CNN, Larry King has given many interviews. Whenever he is asked to reveal his basic tenets of interviewing, he has answered that it is all about: a) listening, and b) not inserting himself into the conversation. Last night on Conan, there was a memorable reaction on the part of the interviewer to that sage b) advice. O’Brien disagreed with the idea of never putting the “I” in interview and got the operator of Camera One to take it one step further and fulfill a fantasy of keeping the camera on him, even when the guest is talking. We’ve got the video cued up to that portion. 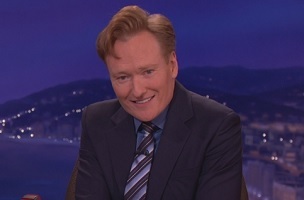 As the camera stays on Conan, King warns that there are two dangers to this self-centered I-nterview technique. The guests will never return, and before they leave, can off-camera do whatever they want. Like, in King’s case, make a na-na-na motion in the host’s direction.